Wait, is that.. Bunta?! Have our wishes been granted? Is this the Initial D Prequel?! Unfortunately, that is not the case. 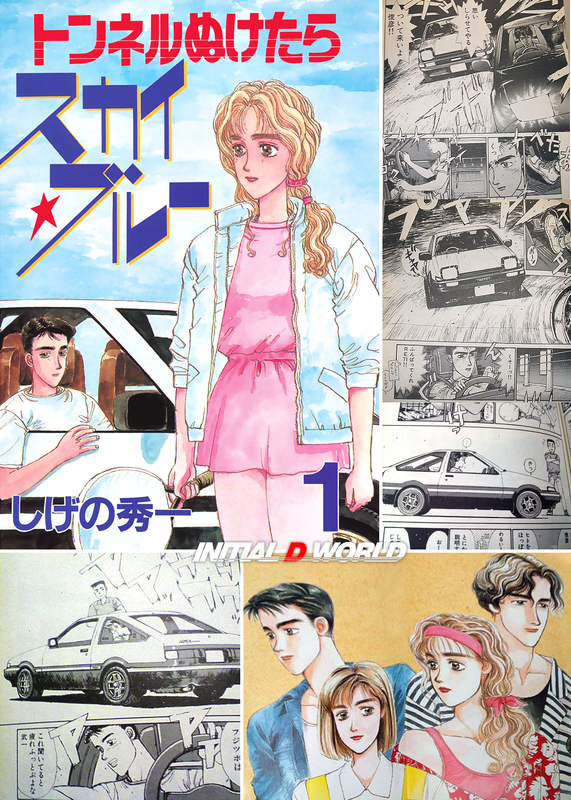 You are looking at one of Shigeno-san's previous works「トンネルぬけたらスカイ☆ブルー」(Tunnel Nuketara Sky*Blue) before Initial D.
First published in January 1992, Tunnel Nuketara Sky Blue is a story about Ishizaka Toshihiko (石坂俊彦), a high school senior student, who drives an AE86 Sprinter Trueno. If you think Toshihiko uses the car for racing, you're going to be disappointed. The story is not about street racing. It's mainly about how Toshihiko deals with his attraction towards two different girls, Chiharu (ちはる) and Maari (真亜理). Toshihiko must decide — will it be Chiharu, who is very much attracted to him; or will it be Maari, who already has a boyfriend..? It's your typical romance novels, it's rather cheesy. And after you read it, you'll finally understand why almost every relationship ends in failure in Initial D. Oh! The story does have one race in it, AE86 vs Z32 Fairlady Z. I won't spoil the result, but let's just say Shigeno used this story to test the water in automotive street racing genre. The artwork is decent but the story is a bit too short. The whole series contains only one volume. Definitely worth checking it out! Image size reduced, original size: 1060 x 1485. Click here to view the image in its original dimension. Ha ha, I think your description gives it away where you say "And after you read it, you'll finally understand why almost every relationship ends in failure in Initial D", maybe?